Everyone remembers Charles Lindbergh and his flight from the US to Paris in 1927, in pursuit of history as well as a $25,000 prize. 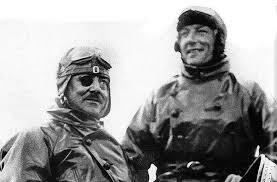 Not so well remembered, however, are Charles Nungesser and Francois Coli, two French aviators who disappeared just 12 days before Lindbergh’s flight, as they tried to make the same Atlantic crossing in reverse, from Paris to New York. Some believe their big Lavasseur biplane, the L’Oiseau Blanc, or White Bird, crashed in Maine’s Washington County after they ran out of fuel in a heavy fog. TIGHAR, a research group that specializes in historic aircraft recovery, came to Maine in April of 1987 to search the dense woods for L’Oiseau Blanc. I took part in that search and wrote about it. MACHIAS, Maine (UPI) – If a certain theory is correct, the big white biplane was nearly out of fuel when it flew low over the Atlantic and skimmed over the eastern coast of Maine in chilly, foggy weather on May 9, 1927. According to the hypothesis, the French pilot flew inland and peered down through the fog, looking for a place to land. He finally sighted a small lake and began to descend in a slow circle. Perhaps the pilot did not see a ridge in front until it was too late, or perhaps the big Lavasseur biplane simply ran out of fuel. Whatever, a fisherman casting for pickerel on Round Lake heard an engine, a ripping sound, a crash, and then, once again, silence. No one knows for sure, but the fisherman, Anson Berry, may have heard the tragic end of an historic attempt to link France with New York by two of the world’s most famous fliers of the day, pilot Charles Nungesser and navigator Francois Coli. 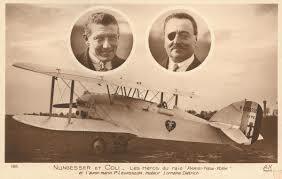 Coli and Nungesser were trying for the prize that lured Charles Lindbergh to attempt the same flight from west to east, just 12 days after the French plane is believed to have crashed. Now, 60 years later, searchers are getting ready to head into the dense Maine woods, about 50 miles east of Bangor, in hopes of untangling the mystery once and for all. Richard Gillespie, an aviation historian who is heading the search for the White Bird, said the chances of finding the plane’s wreckage are fairly good if his theory about the end of the flight proves true. Previous searches have narrowed the area to be covered, he said, and some sophisticated equipment will be used for the first time, which may make it possible to locate the plane from the air. Gillespie’s group, The International Group for Historic Aircraft Recovery, or TIGHAR, plans to send a crew to Maine today to lay down search grids. On Saturday, ground crews will begin searching the woods for the remains of the plane. The search will continue through the weekend of May 9-10, and Gillespie hopes that will be enough time to find the wreckage.